The Prokletije mountains are one of the highest and without doubt most hyperkarstic mountain ranges of the Balkan Peninsula whose white naked karstic and jagged ridges and peaks, build form limestone and dolomite show many cirques that create an imposing wild image which sends shivers and fear to visitors as geographer Jovan Cvijic said in 1913. 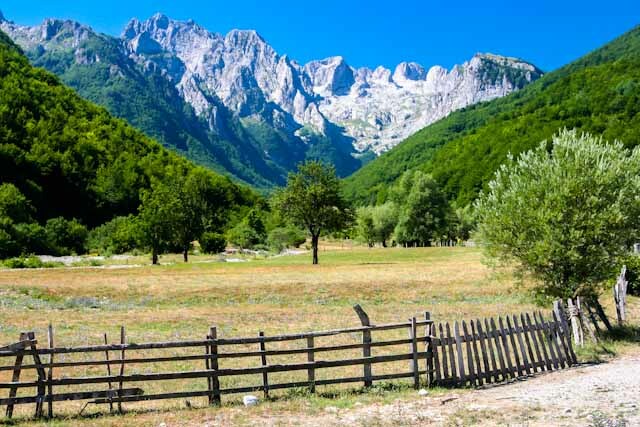 Because of it’s impressive and amazing beauty, Prokletije mountain range is also known as the “Southern Alps of Europe”. Prokletije is surely one of the last mountains in Europe that has not been discovered entirely yet, one of the most enclosed, most reserved and most romantic places in Europe. The Alps, the Dinaric Alps and the Prokletije Ranges represent a unique mountain system made by a folding action of the African plate which is under the European one. This process is visibly evident also by the constant listing of the Adriatic coast. The Dinaric Alps, 1000 kilometer long, follow the direction of the Adriatic Sea and at their northwest and southeast ends formed the ‘aggregates’ of the Alps and the Prokletije massif. These two groups are of latter geological origin, made by the action of tectonic forces on the edge of the plate. This theory is confirmed by the great tectonic divide which extends from Herceg Novi towards Trebinje, and farther inland. This divide was made by cracks in the Balkan land, due to the resistant force of the Prokletije mass. Along this fissure there are constant earthquakes of tectonic origin. Like the Alps, the Prokletije mountain range also deviates from the extension of the Dinaric Alps. The massifs and aggregates that formed are very tall. The French travel writer Ami Boue was right when he called the Prokletije, “The Southern Alps”. Many geographers today consider the Prokletije as a continuation of the Dinaric Alps. 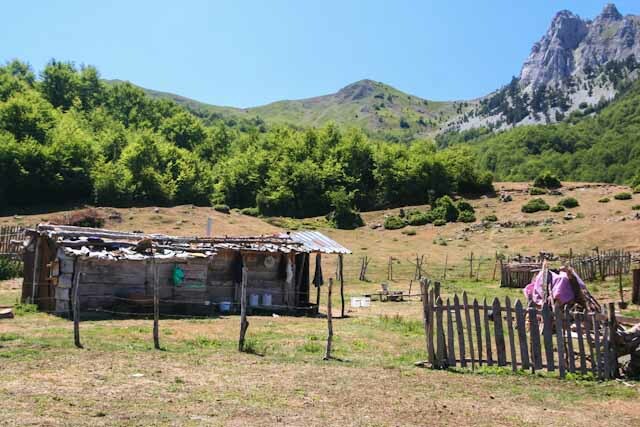 The names “Prokletije” and in Albanian “Bjeshket e Nemuna” (mean “The Damned Mountains”), which describes the cruelty of these mountains and the hard life of those who live in their vicinity. Nevertheless, the atmosphere of the whole mountain range is extremely mysterious and wild. The Prokletije range consists of 40 mountain wreaths between the Zeta plain, the Drim River, Komovi and Bjelasica, all to the mountains of the Kucka Krajina. The mountains around Plav and Gusinje are massifs in the confluence of the rivers Komoraca, Jasenica and Djuricka Rijeka, southeast of Plav, then the rivers Vruja and Dolja, on the southwest of Gusinje. All of these rivers are right tributaries of the Lim River. From the left this area is bordered by somewhat lower mountains with steep slopes, which extend toward the Plav and Gusinje valley with the mountains of Lipovica (1882 meter), Greben (2196 meter) and Visitor (2211 meter), while from the north wreath is Zeletin (2126 meter). Between the Montenegrin an Albanian border occupies most of the Prokletije range and their peaks are above 2000 meter. It is a hydro – geologic watershed of the Adriatic, the origins of the Drim River and its tributaries and the Black Sea river basin, as well as the Lim River and its tributaries. The Prokletije range in Montenegro is approximately 250 square kilometers, and extends from Skadarsko Jezero to Bogicevica, on the border with Kosovo. 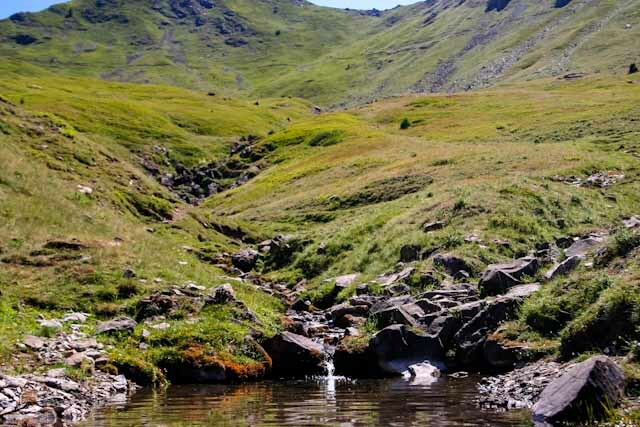 In a wider sense, Montenegro’s Prokletije mountain range is bordered by the rivers Cijevna, Lim and Ibar. Massif of Prokletije mountain rises gradually toward southwest and northwest, ending up with the highest peaks of Bogicevica and Cakor and Rugova passes, where the highest crests Maja Jezerce (2694 meter) is on Albanian territory, Djeravica (2656 m) on Serbian and Maja Kolata (2534 m) on Montenegrin territory are located. Maja Kolac (2528 meter) and Dobra Kolata (2528 meter) are the two highest peaks of Montenegro. But, officially the highest peak of Montenegro is Bobotov Kuk (2523 meter) in the Durmitor massif. Reason because Durmitor is in the center of Montenegro territory and it is closer to heart of Montenegrins than Prokletije peaks on border with Albania, which are not in the inside of the country. There are many kinds of alpine rocks in the Prokletije Range. Listing the most famous; Koplje (600 meter), Volusnica (250 meter), Ocnjak (180 meter) and Karanfili’s norhern peak (450 meter). Valleys are deep and wide while peaks are edgy and seem to be almost inaccessible. The erosion of the Prokletije mountains by glaciers left many telltale features behind. Deep river canyons and flat valleys wind around the ridges of the mountains. 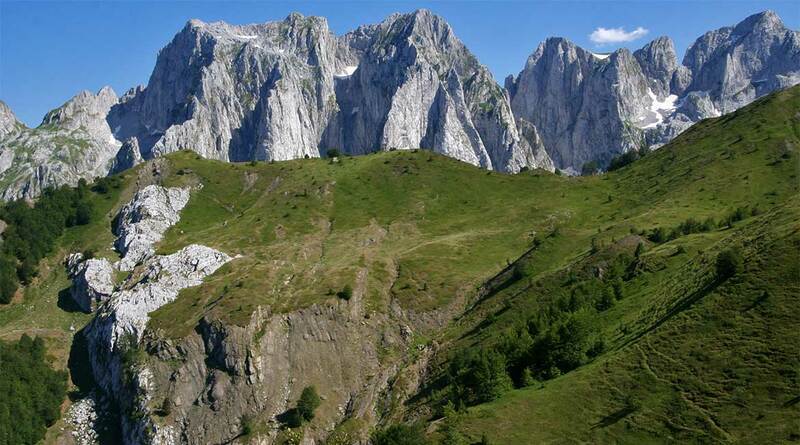 The largest and most popular canyon is Rugova Canyon. It is situated in Kosovo and is 25 kilometer (16 mi) long from the border with Montenegro to the city of Peć and is 1,000 meter (3,281 ft) deep. It has very steep vertical mountain slopes on both sides. Valleys common at lower altitudes are also found at the alpine level, creating mountain passes and valley troughs. 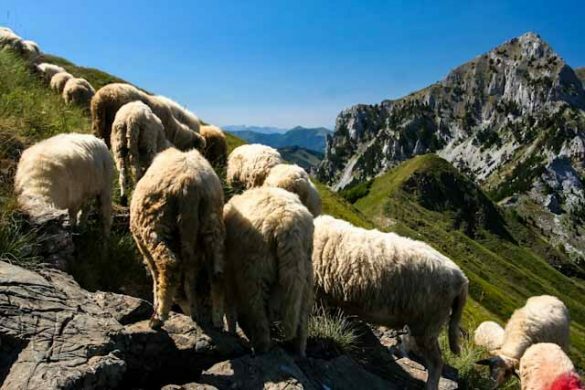 The most well-known valley to be high up in the mountains is Buni Jezerce in Albania. Buni Jezerce means “Valley of the Lakes” and it contains six small glacial lakes, the biggest being called the big lake of Buni Jezerce. There are a plenty of smaller or bigger glacial lakes in the mountains. Their number is the second most one in Europe following the Alps. Plavsko Jezero lake is the biggest one along the shore of which a lot of holiday homes and pensions were built. Located at an altitude of 906 meter above sea level, and extends north-south for some 2,160 meter. Its average width is 920 meter, and its maximum depth is nine meters. The geology of Plavsko Jezero and the surrounding lakes, streams and rock formations is very interesting. The lake itself is full of limestone caverns and there are many springs where water gushes forth from the earth.